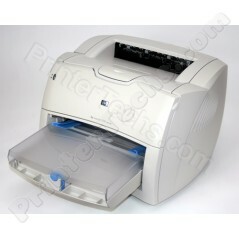 The HP LaserJet 1200 is a great small personal laser printer. It's smaller in size and has fewer available options than the larger LaserJet 4000 and 4050 series of printers (no duplexer, envelope feeder, or 500 sheet lower cassettes). This printer is targeted at users who don't need the accessories and won't be printing quite as heavily as the LaserJet 2x00 series user. We no longer refurbish the LaserJet 1200, but recommend the LaserJet 1320 instead. 16.3" x 19.1" x 10"